"If I had a world of my own, everything would be nonsense. Nothing would be what it is, because everything would be what it isn't, and contrariwise, what it is, it wouldn't be. And what it wouldn't be, it would. You see?" Over a hundred years ago, an English mathematician named Dodgson told a nonsense story to amuse some little girls, the Liddells, one of whom was named Alice. 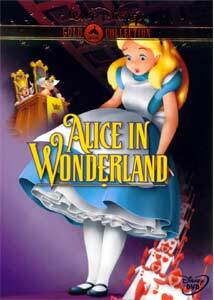 This impromptu tale became the book Alice in Wonderland, and it made what is probably its best transition to the screen in this animated version from the Walt Disney Studios. Alice (Kathryn Beaumont) prefers not to study, and wishes she were in a land of nonsense. No sooner is the wish out of her mouth than she is in pursuit of white rabbit in a waistcoat muttering that he's late. Alice follows and has one bizarre adventure in Wonderland after another, changing size enormously and meeting all manner of utterly mad characters. Finally Alice meets up with the alternately pleasant and vicious Queen of Hearts and is threatened with the loss of her head. Disney's adaptation didn't do well on its original release, but with the 1960's an appreciation of its colors and effects brought it a heightened recognition. It still holds up wonderfully well, with many terrific character actors in supporting roles (most notably Ed Wynn, Sterling Holloway and Bill Thompson). The animation forms a boundary of sorts between the old style of the Disney studio, with its beautiful realistic backgrounds (best seen in the framing sequence along the river) and the more television-cartoonish simplicity of Wonderland. The animation throughout is creative and colorful, and is shown to excellent effect on DVD; the appearance of the picture is far, far superior to the VHS version. The songs mostly aren't well-known classics, other than the White Rabbit's "I'm Late." However, some of them are very nice indeed, such as The Walrus and the Carpenter and All in the Golden Afternoon. The story occasionally slows down, such as the caucus race which although brief seems to go on forever. However, before long, the scene changes and we're off to another mad adventure, so it will probably hold most kids' interest. I've always found the King of Hearts to be the most hilarious character in the film, but there's plenty of slapstick and verbal humor for the entire family to enjoy. The film is rated "G", but younger children, as usual in a classic Disney film, may be frightened by certain sequences, especially the fall into the rabbit hole. The constant threats of decapitation by the Queen of Hearts may require some parental discussion. Those concerned by the censorship by Disney of Melody Time and Make Mine Music will be pleased to know that the caterpillar sequence makes it to DVD intact. No doubt Disney believes (probably correctly) that hookahs do not pose a threat to children's morals. Image Transfer Review: The picture is excellent throughout. The blacks are solid and rich, and the colors (especially the blues and purples) are bright and wonderful. No frame damage whatsoever is visible. Shadow detail is excellent as well. The only thing keeping this from a solid "A" rating is the fact that reds appear to be just a smidgen oversaturated, and a very slight shimmer is detectable in the backgrounds of the framing story. In a few sequences, Alice's skin tone is a little bit unstable. Overall, however, the clarity and brilliance is spectacular. This is a beautiful transfer, with just a few tiny reservations that really don't affect enjoyment of the film. Compression was obviously watched very closely; bit rates are all over the map, from as low as 4 Mbps to spikes up to nearly 10 Mbps. Apparently the feature is on one layer and all of the extras on another, giving us maximum resolution. Audio Transfer Review: The English track is DD 5.0. The dialogue is almost entirely in the center channel. The surrounds are used for music and atmospheric effects only. There is no significant directionality to be heard. The dialogue is all clear (although the British accents can be a shade difficult at times, making the subtitles a blessing) and the music has excellent range. No distortion, noise or hiss is to be heard at all. The Spanish track is DD 2.0 cannot be selected on the fly. It is passable, with adequate sound, although the voice talent isn't the equal of the English track by any means. Extras Review: In addition to the usual selection of Disney DVD extras, there is a nice little promo featurette from 1951. This gives us some footage of Walt himself, Kathryn Beaumont and Ed Wynn, acting through some of their parts (as well as Beaumont studying algebra on the set). This brief promo piece is mainly interesting for its historical content than any real information which is provided to the viewer. The black & white film is in pretty good condition, though not anywhere the equal of the feature. The theatrical trailer is from a re-release, and is in quite poor condition. The colors are drab, the print is scratchy and the picture is generally murky. It's nice to see this as a comparison to the beautifully restored feature. The trailers for the other films are for their DVD incarnations, and are unfortunately forced on the viewer. You can, however, skip them with use of the Chapter Forward control. The disc includes a trivia game with 16 answers, along with positive feedback for each correct answer. There is a DVD storybook of the film, which can either be read to the child, or can be read off the screen. Finally, there are two singalongs, with the lyrics lit up on the screen as they are sung. The relevant scenes from the film run along with the song. Disney continues its commendable program of a $5 mail-in rebate for DVD purchasers upgrading from VHS. This program definitlely helps make the upgrade much more palatable for those on a budget. A beautiful transfer of a classic and highly entertaining animated film. The supplements are a little better than the usual "Gold Collection" fare. Very highly recommended.